The city of Los Angeles has had light-rail for 20 years, some at-grade, some underground. Still, according to an article in the New York Times, new projects are still paying off for residents of the city. Early in June, the Times published an article about the business development along the Expo Line, the newest addition to the Los Angeles County Metro Rail system. Along the Expo Line, transit-oriented and mixed-use development that will not only revitalize some stagnating neighbourhoods--and bring money and jobs to those who need them. In addition to removing tens of thousands of cars from the road — 64,000 daily riders by 2030, according to transit authorities — the 15.6-mile Expo Line is expected to spawn a variety of mixed-use real estate projects, as some of the city’s previous rail lines have done. A project including more than 500 units of housing and a 300-room W hotel was recently completed at Hollywood Boulevard and Vine Street, and a rental and retail complex was built at Wilshire Boulevard and Vermont Avenue in 2007. The Expo Line's first phase (from Culver City to downtown Los Angeles) runs 8.6 miles, or almost 14 km--a little bit longer than the 12.5 km LRT plan in Ottawa. One end of the line begins underground (the 7th Street metro center), which quickly emerges and runs at-grade for much of the route, with the exception of "aerial stations", one over La Brea Avenue, and the other over La Cienega Boulevard. The budget was initially supposed to run USD640M, but delays pushed the cost up $220M and pushed it back by a year, and now sits at mid- to late-2011. Still, even though we're comparing apples and oranges, it's a little reassuring to see an LRT line cost USD860M (about CAD890M) when ours is budgeted at CAD2.1B, even if it is concerning to hear of yet another LRT project with massive delays and cost overruns. 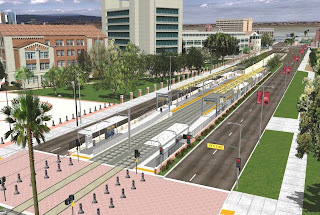 Still, it's worth noting that many of those delays and cost increases have resulted from changes to the plan, including specifically the decision to add a station at the University of Southern California. Makes it all the more important for the City of Ottawa to keep in mind--cancelling or altering a transit plan once it's underway will often lead to cost repercussions, so it's important the plan is the right one before it's started.